The Windows computer users always face one error on another while using the computer. As a long time windows user, the frequent errors are pretty standard. Thanks to the Windows 10, we see decidedly fewer errors. But the errors that we encounter in Windows 10 are pretty severe and complicated. Amongst all these, the KMODE_EXCEPTION_NOT_HANDLED error is one such annoying error in the windows. If you know the Blue screen of death error in Windows 10, then the KMODE Exception not handled error should be familiar. The Kmode exception windows 10 is the Blue Screen of Death error. When the system runs into unavoidable circumstances like the Kernel Failure or Core services shut down, the users will encounter the BSOD. When you see the BSOD, you have to assume that all your ongoing work has been ruined and you’ve lost everything that is not saved on the hard disk. As this error appears any time without warning, the people lose their important unsaved work. That’s why we are going to share some working solutions to get rid of the kmode exception not handled windows 10 error. These methods or the answers are going to help you fix this problem within a few minutes. What is KMODE_EXCEPTION_NOT_HANDLED Error in Windows? How to Get Rid of KMODE Exception Not Handled Error Windows? The Windows Operating system runs in two modes. The first is Kernel Mode and the second is the Application mode. The Kernel mode is the mode in which the essential services of the system are run. The core services that help the system to work appropriately uses the Kernel Mode. If there are some problems with those services and the Kernel Mode is unable to handle the errors, then you see the Kernel Mode Exception error in Windows. Also, if any of the system service, software, background processes, Registry keys or the DLL files are corrupted, then you may encounter the Kmode exception BSOD error in Windows 8 and 10. Also, overclocking the CPU or RAM modules is one of the common reason behind this problem. If you don’t get any bit of what we’ve explained, then there is nothing to worry. You are here to solve the problem and not to know it’s history and the origin. There are several methods to get rid of Kmode exception BSOD error. In this post, we are seeing some simple techniques to fix this problem within a few minutes. The fast startup is the unique feature in Windows which allows the users to boot in the system quickly. This feature neglects to load the low priority services on the startup. Such services may cause the issue, and you might see the Blue Screen of Death Kmode Exception error on your computer. 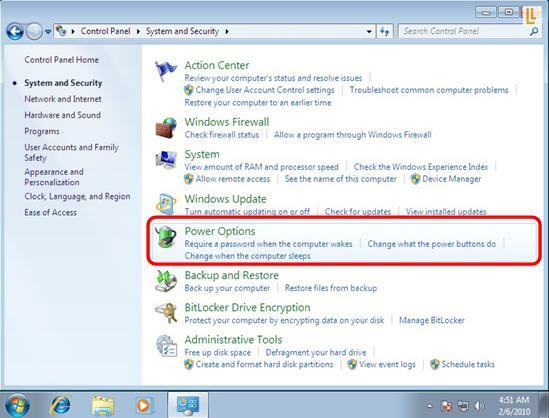 In the Power Options, click on “Choose what power buttons do” option. Now, click on the “Change settings that are currently unavailable” and provide Administrative Access if asked. 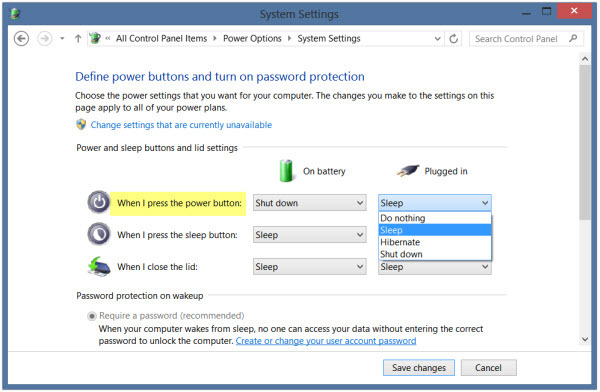 Uncheck the checkbox beside the “Turn ON Fast Startup” option and then click the “OK” button. Restart your computer to let these changes take effect. The device drivers handle the communication between the Hardware and the operating system. Without the device drivers, you won’t be able to use any of the connected devices. The drivers are the once who access the kernel mode in the Windows. If any of the connected devices have the corrupted or outdated drivers, then you could encounter the KMode Exception Not Handled BSOD error on the computer screen. The best course of action to avoid this error should be to Update outdated device drivers. First, press “Windows + X” key combination on your keyboard and select the “Device Manager.” Alternatively, you can Press ‘Windows + R” key combination to open the RUN window and then type “devmgmt.msc” and then press ENTER. 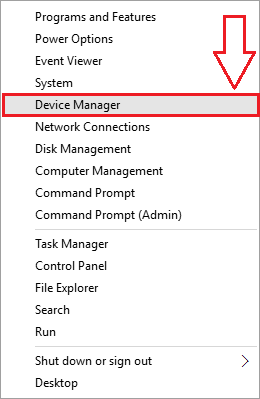 In the Device Manager, you’ll see all of the connected devices. Scroll down and find the “Unknown Devices” drop-down menu. 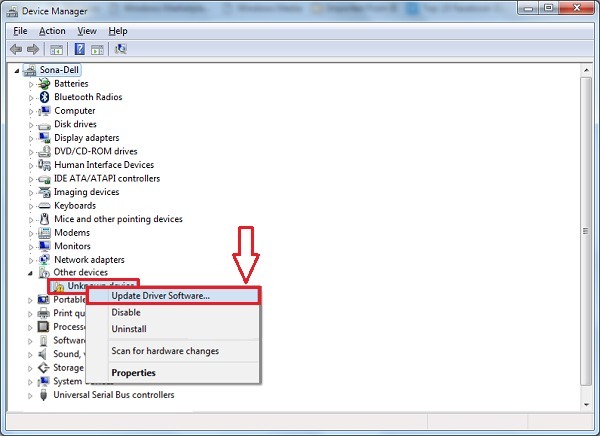 Click on it to check corrupted and outdated drivers. 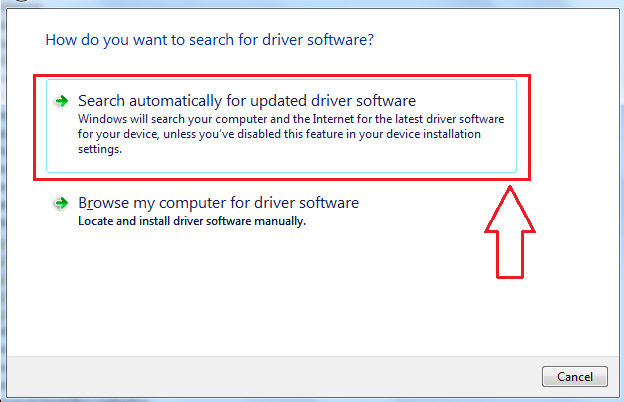 Right-click on them and click “Update Driver Software” and then select “Search automatically for updated driver software” button. Let the driver installation process complete. Follow the steps three to five till you update all of the corrupted drivers. After completion, Restart the computer to let these changes take effect. The Microsoft is aware of the error their users are facing. If the Kmode Exception BSOD error is the mistake from the Microsoft side, then you should get the Update. The Windows updates are focused on the Bug fixing and security issues patches. If the issue is common on the particular version of Windows, then there are high chances that Microsoft has sent the patch for this issue. That’s why, we are advising you to Install the Latest Windows Updates. If there are updates available, then this issue will never annoy you after installing the update. The annoying error is messing your unsaved work and the productivity. That’s why fixing this problem as soon as you encounter it is the best option. We’ve tried to mention all of the best solutions to fix Kmode exception not handled error Windows 10. All you have to do is to follow the steps we’ve said in this post. Follow these methods, and you’ll have an Error free computer within a few minutes.